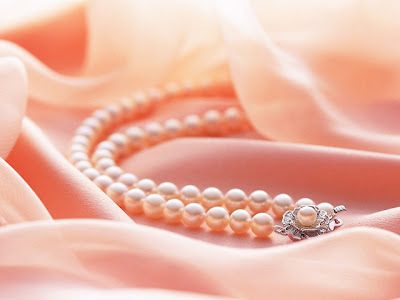 One day when she and her mother were checking out at the grocery store, Jenny saw a plastic pearl necklace priced at $2.50. How she wanted that necklace and when she asked her mother if she would buy it for her, her mother said, "Well, it is a pretty necklace, but it costs an awful lot of money. I'll tell you what. I'll buy you the necklace, and when we get home we can make up a list of chores that you can do to pay for the necklace. And don't forget that for your birthday Grandma just might give you a whole dollar bill, too. Okay?" How Jenny loved those pearls. She wore them everywhere to kindergarten, bed, and when she went out with her mother to run errands. The only time she didn't wear them was in the shower - her mother had told her that they would turn her neck green. Now Jenny had a very loving daddy. When Jenny went to bed, he would get up from his favorite chair every night and read Jenny her favorite story. One night when he finished the story, he said, "Jenny, do you love me?" Several days later, when Jenny's father came in to read her a story, Jenny was sitting on her bed and her lip was trembling. "Here, Daddy," she said, and held out her hand. She opened it and her beloved pearl necklace was inside. She let it slip into her father's hand. With one hand her father held the plastic pearls and with the other he pulled out of his pocket a blue velvet box. He had them all along. He was waiting for Jenny to give up the cheap stuff so he could give her the real thing. So it is with our Heavenly Father. He is waiting for us to give up the cheap things in our lives so that he can give us beautiful treasure. Isn't God good? Are you holding onto things which God wants you to let go of? Are you holding onto harmful or unnecessary partners, relationships, habits and activities which you have become so attached to that it seems impossible to let go? Sometimes it is so hard to see what is in the other hand but do believe this one thing....... ......... .